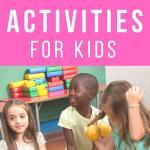 Are you looking for the best sensory activities for preschoolers or older kids? 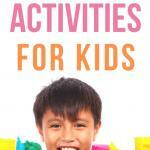 Meraki Mother’s ultimate list of sensory activities for kids of all ages will give you tons of ideas! Sensory activities involve hands-on playing through touching, tasting, smelling, seeing, moving and hearing. These activities enhance learning while stimulating the child’s senses. 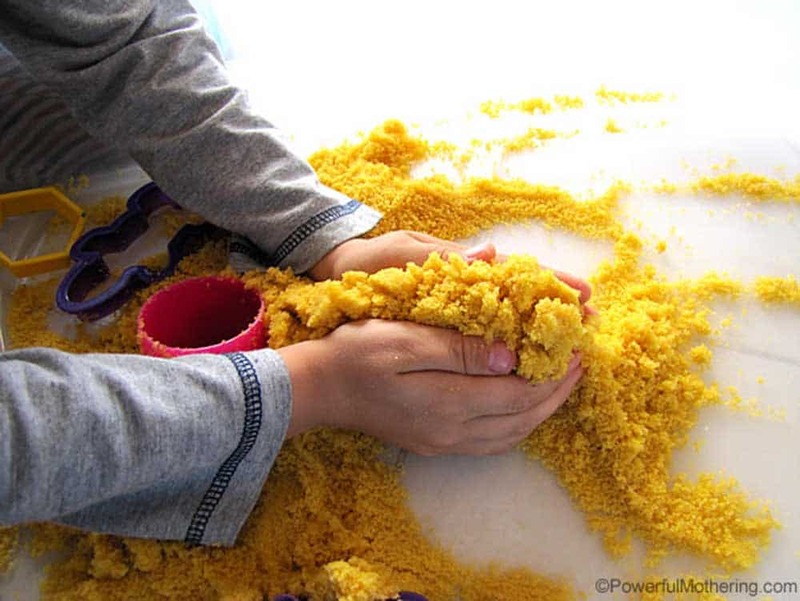 Sensory play lays an important foundation for later learning skills. It doesn’t only helps a child to differentiate sharp from round, smooth from rough and cold from warm but also helps them verbalize the various sensations they feel. Many activities are also considered calming and therapeutic. Sensory activities also naturally encourage children to use scientific processes while creating, playing, investigating and exploring. This is a basic step in empowering the brain’s ability to discover, classify and sort more complex information later in life. Therefore, providing opportunities for sensory play is crucial to children’s brain development. The good thing is that there are hundreds of ways that kids can learn through sensory play, possibilities are in fact endless! We have created a comprehensive list for you to get inspired, most are sensory play adults can set up today with things around the house. Enjoy! Click on the activity to go straight to the tutorial! Perhaps the most popular and easily accessible, playdough activities play an important part in sensory and fine motor skill development. Homemade play dough recipes will provide different scents and textures discovery as well as creative play opportunity for kids of all ages. 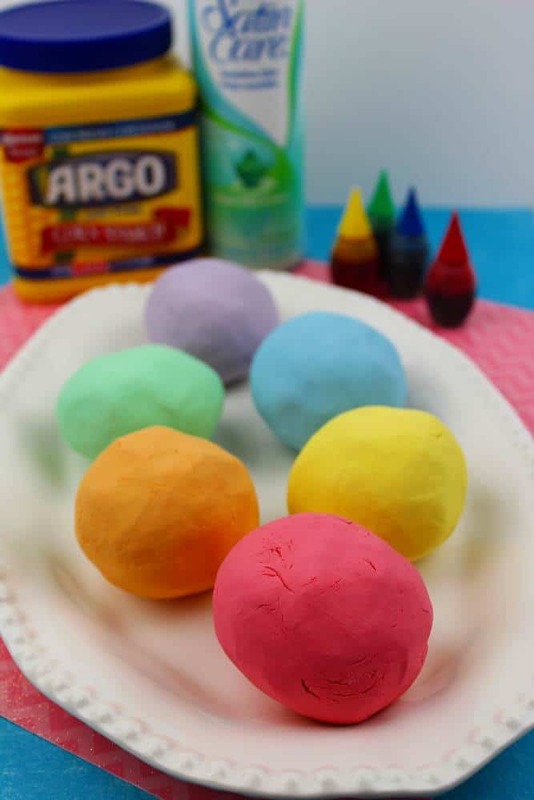 All of the following DIY playdough recipes are made using super-quick instructions. Not your grandma’s playdough! This simple playdough recipe without cream of tartar uses no salt, no flour, doesn’t require baking and of course doesn’t use cream of tartar. It doesn’t get any easier than that! 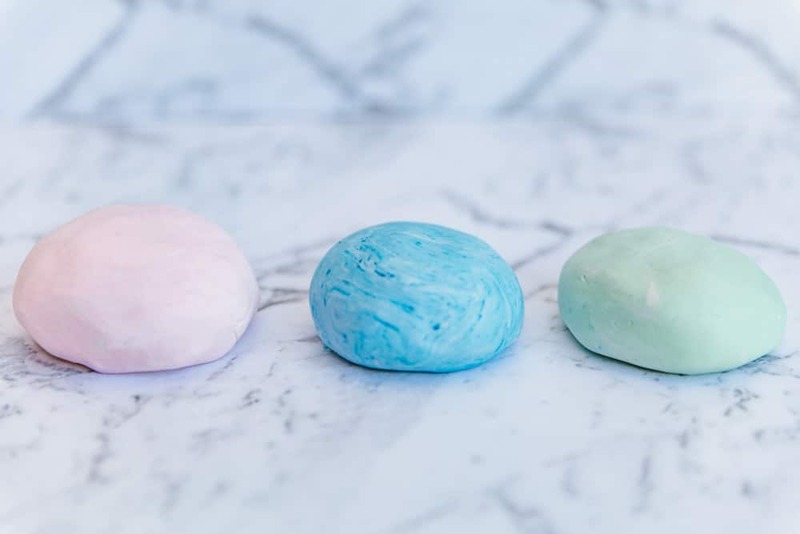 This easy playdough recipe only requires three ingredients you probably already have at home. Made with only two simple ingredients this dough is so soft it is also called cloud dough. Click to get the softest playdough recipe here. 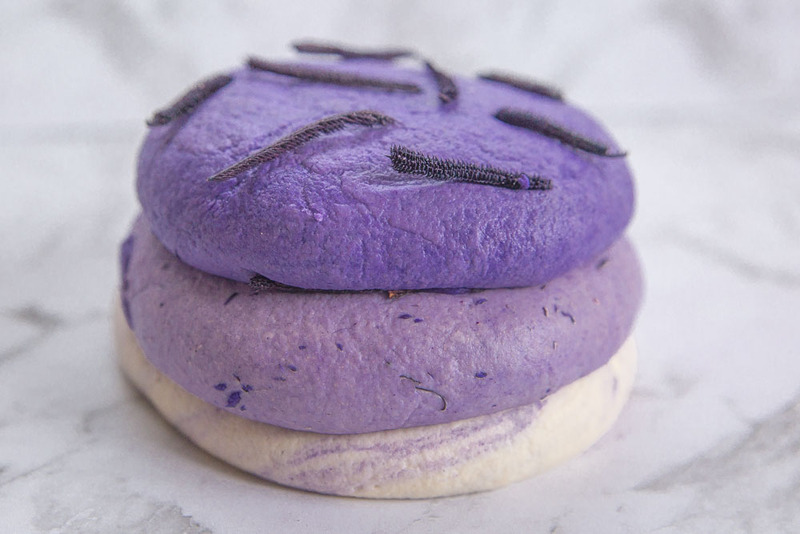 This Lavender Playdough recipe is a great sensory learning experience as well as having a calming effect during play. Need some Essential Oil inspiration for your next scented playdough recipe click here. 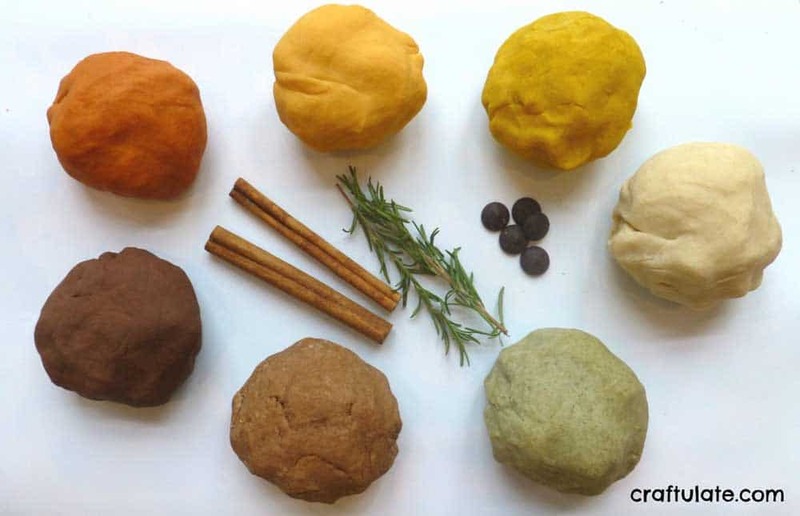 These beautiful and natural play doughs are easy and smell amazing! You can use whatever natural herbs and dyes you have on hand for these. Kneading and creating with playdough are considered calming sensory activities. 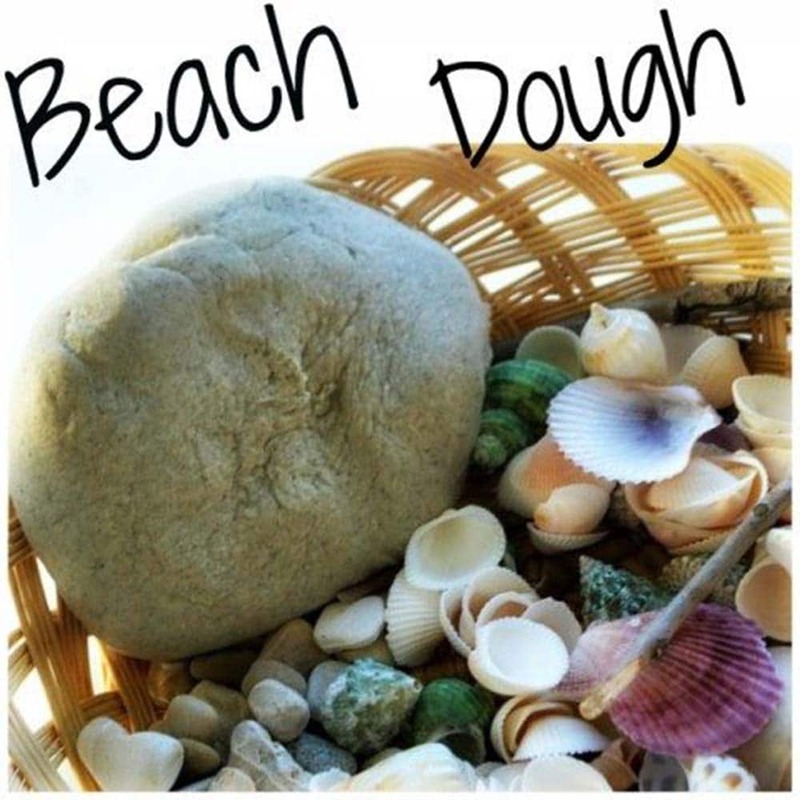 This beach dough is an excellent option for summer season. I love this baby safe cloud dough! So easy to make and totally edible! Are you guilty of spending hundreds of bucks on LUSH bath playdough? I know I am. That stuff is expensive! 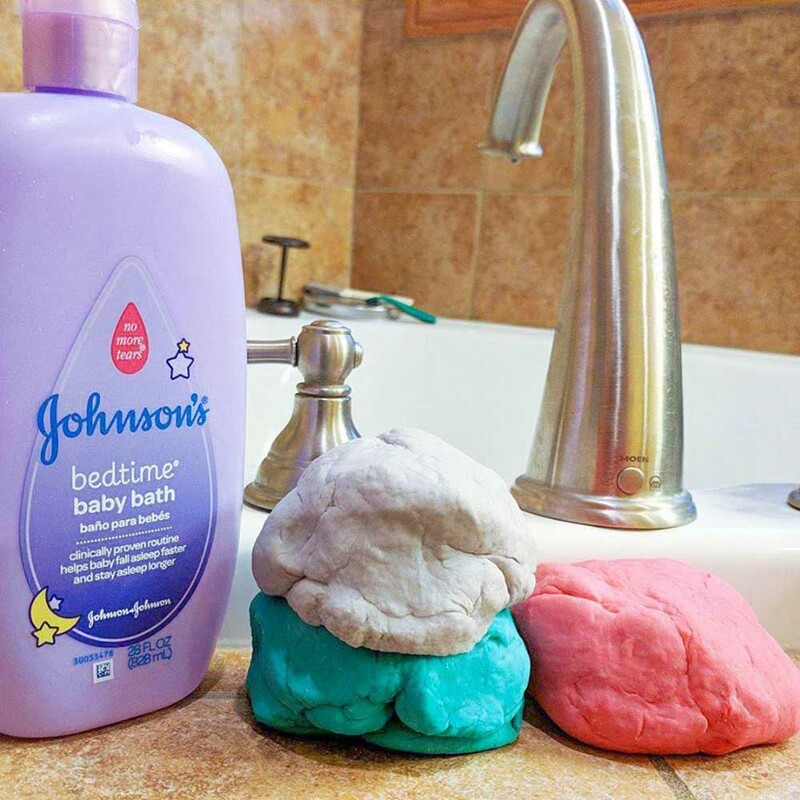 That’s why I love this homemade playdough soap! And the best part is that there’s absolutely no cleanup! Goodbye mess down the drain! 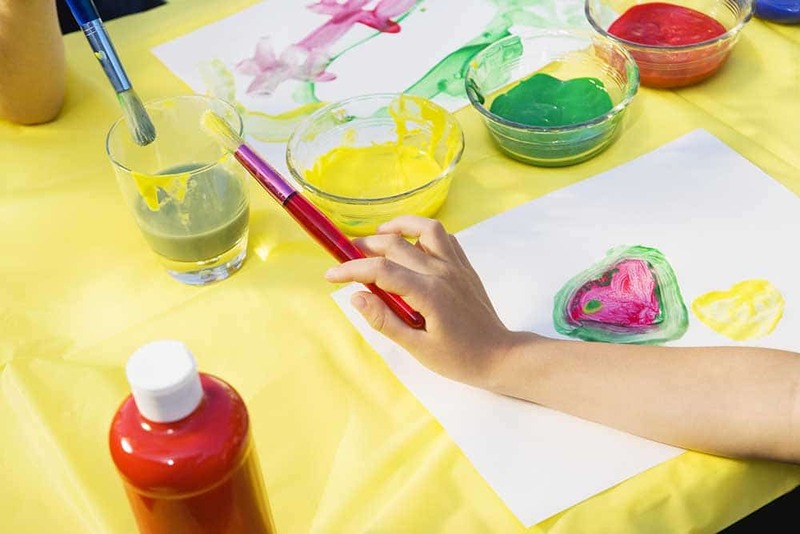 Playful painting is a fine motor skill activity and an open ended creative sensory experience where the process is more important than the final product. 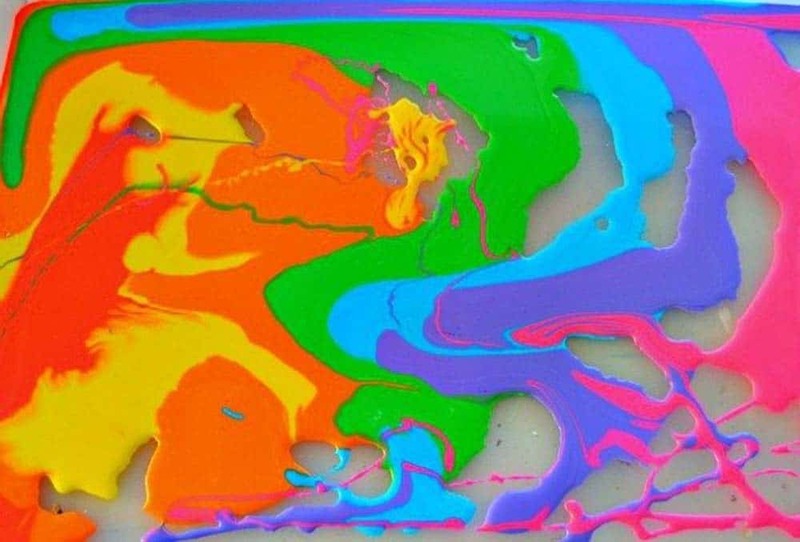 It provides opportunity for the kids to experience color, temperature and texture of paint. This is so simple to do at home but also great as sensory classroom ideas. A fantastic sensory integration activities for adults and kids. Need to top up your paint supplies? Find best prices on kid-friendly paint here. 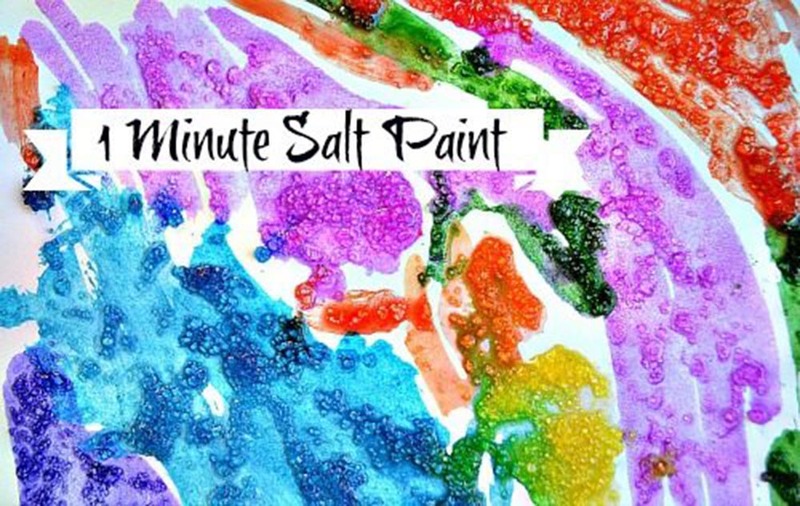 Do your kids love finger painting, but also love to eat paint? 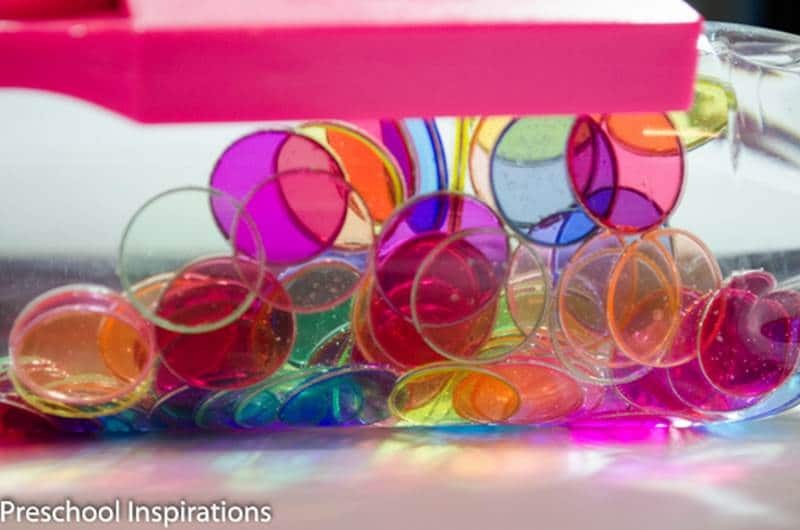 These also make the perfect sensory play ideas for babies. 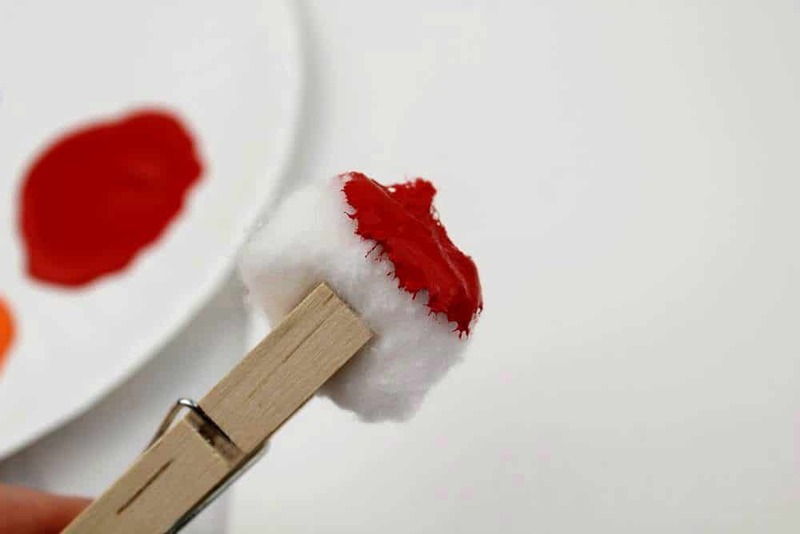 Let them paint with these awesome Jell-Ol-o finger paints! 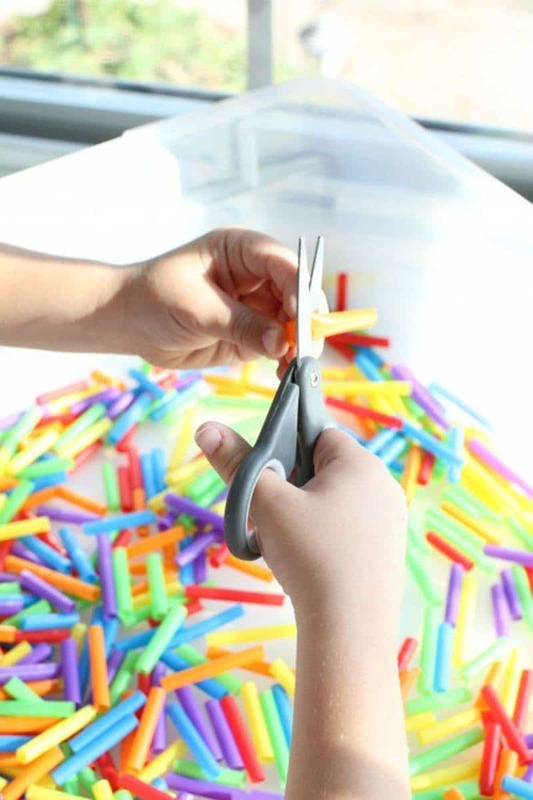 A mix of fine motor and texture activities for toddlers in one go! 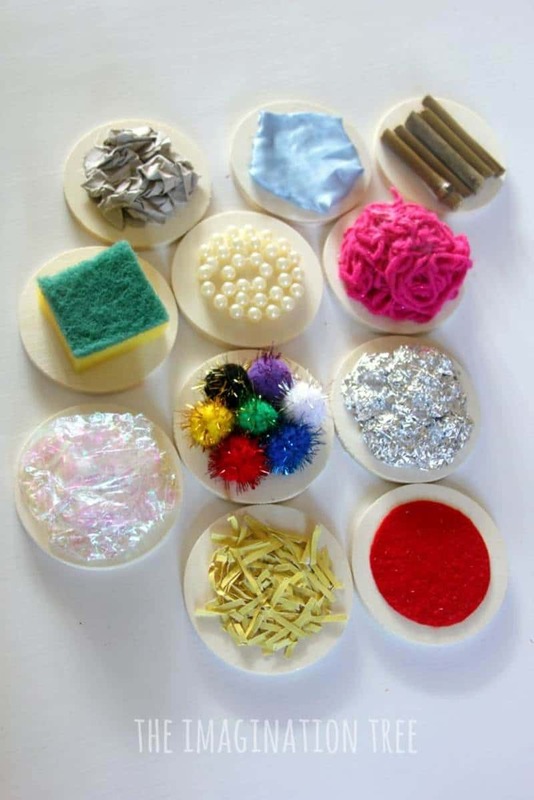 Simple sensory play materials for toddlers. I love any non messy play ideas for babies under 1. 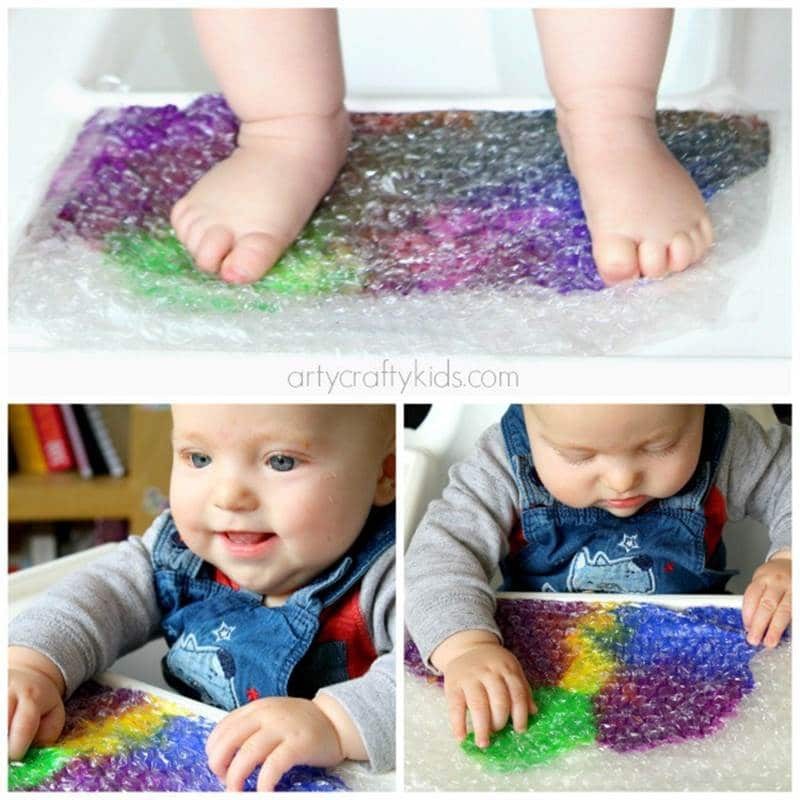 You can set up this baby sensory game using some bubble wrap and paint, so easy! Don’t have any bubble wrap at home? Buy bubble wrap here. Sensory motor activities are super important during early childhood. This is a great idea for foot painting. Sense of touch activities for preschool are always fun. 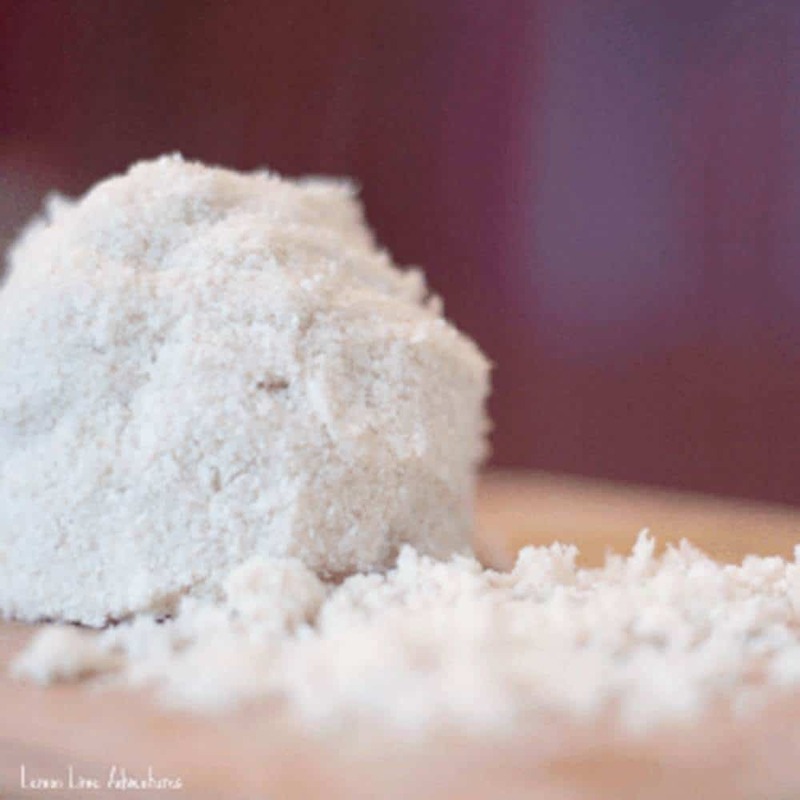 Add that little extra texture with this simple recipe. 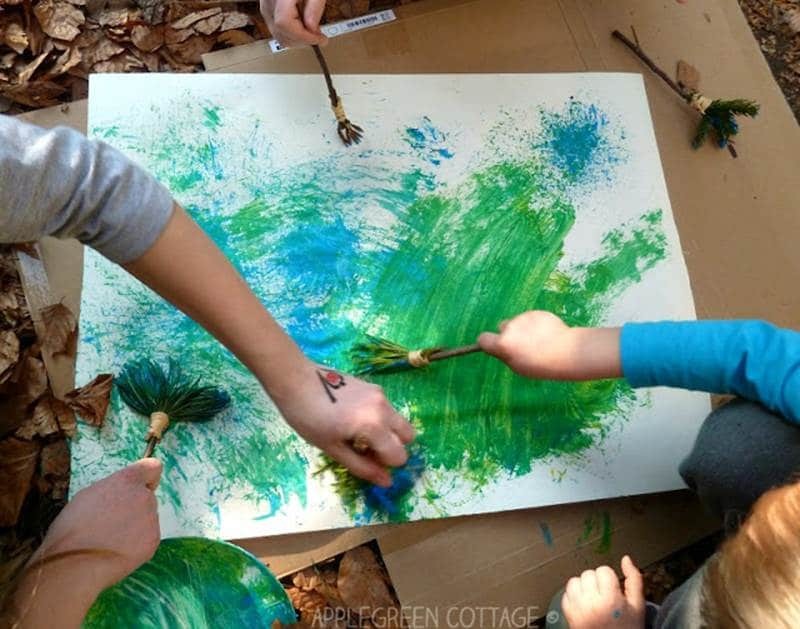 What a great way to improve interaction with nature, make these nature paint brushes today and have lots of fun with the kids. Sensory bottles are any container filled with different materials as a way to encourage kids discovery. 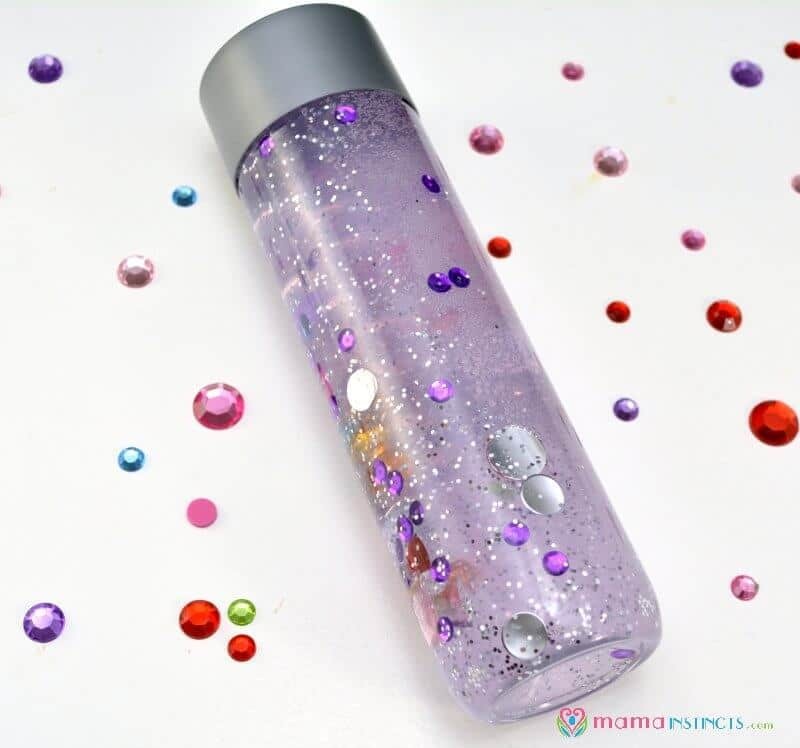 Bottles are a totally non-messy sensory activity and great for trips or any time that you wish to keep mess to a minimum. 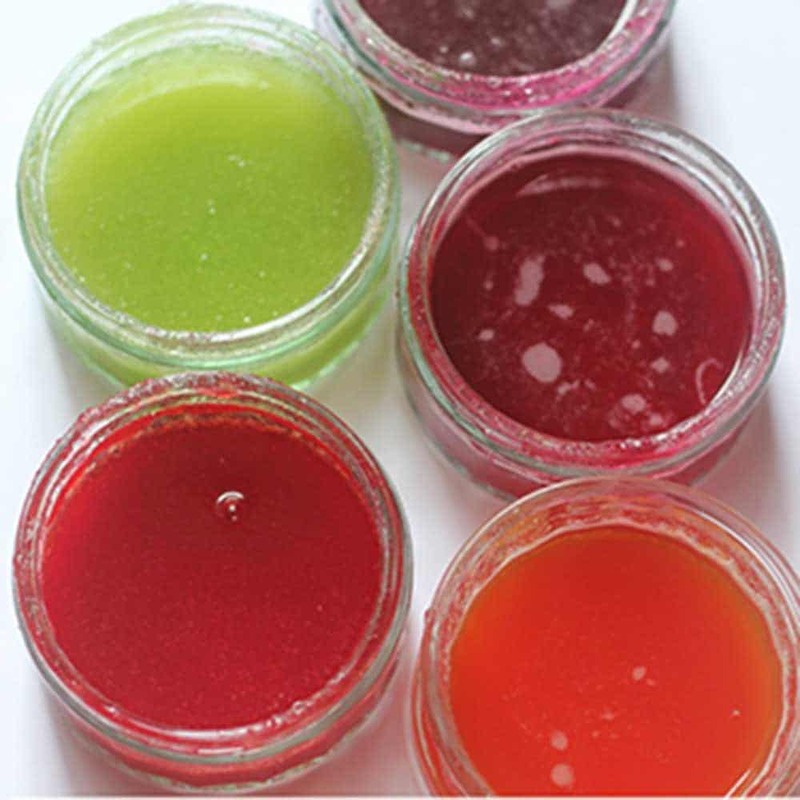 Sensory bottles are early childhood friendly and children-safe, as they don’t have any contact with the materials. Calming non messy play ideas are the best, agree? Make a few bottles like this shine one here and you will have a great collection of sensory ideas for infants. Click here to top up your bead and glitter supplies. 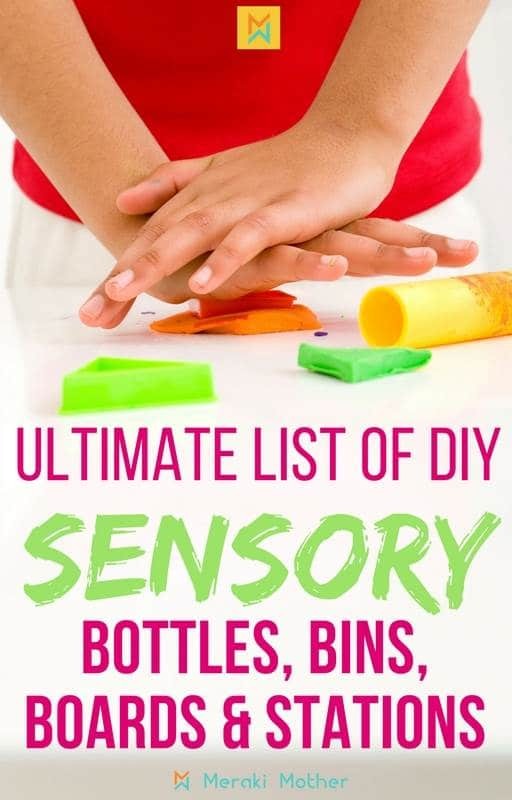 If you want to make your own sensory toys for toddlers these discovery bottles are a great idea! Playing with the magnets and bottles will be great sensory activities for 2 year olds and will inspire curiosity. The recipe for success? 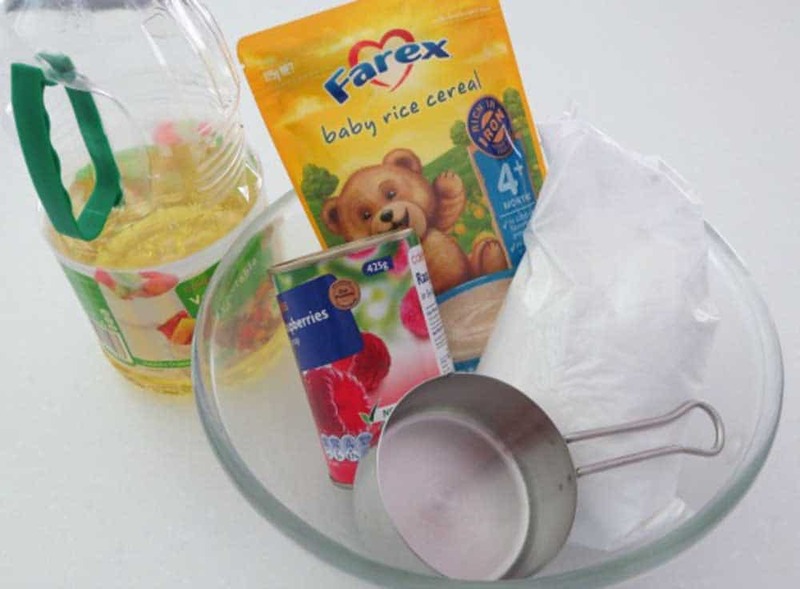 Non messy play recipes! 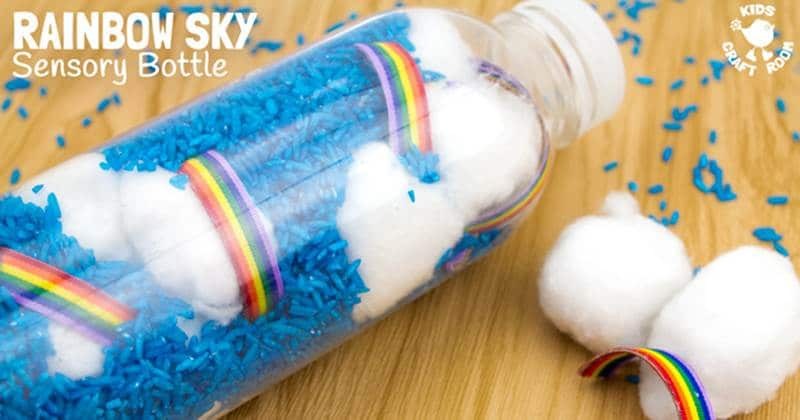 Who would not want to play with these cute rainbow discovery bottles? 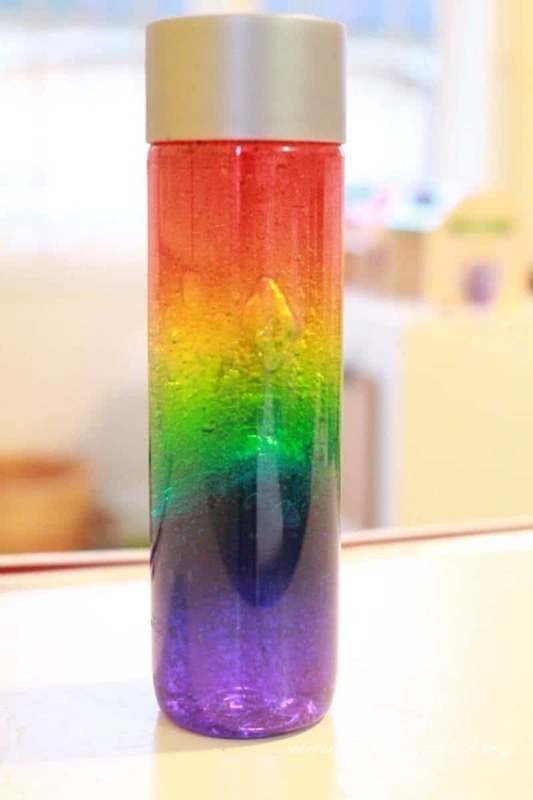 You can also use these bottle as science sensory activities for preschoolers. One of the cutest sensory stimulation activities you can make. 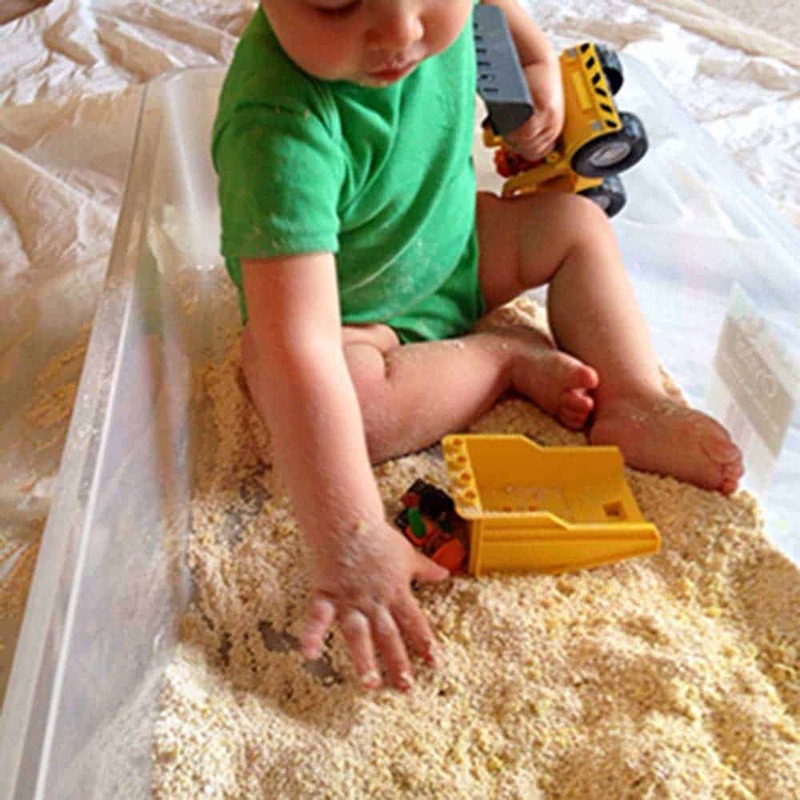 Sensory bins or sensory containers are perfect for containing messy play for kids. Add your materials to your sensory tray ideas and it will only contain the mess, not the fun! 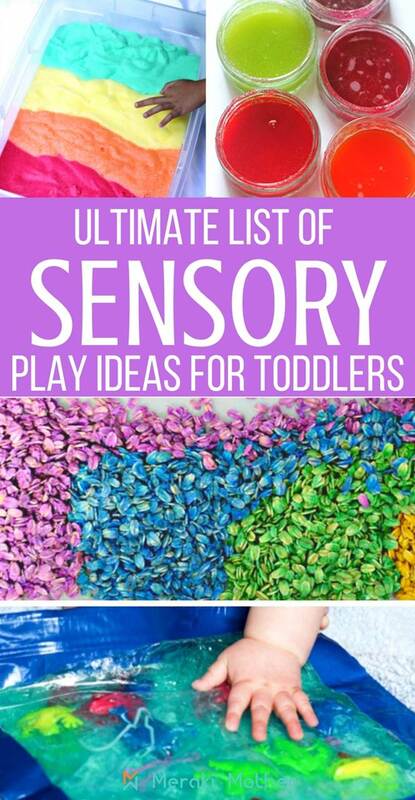 Here are some sensory bin ideas for toddlers and kids of all age. 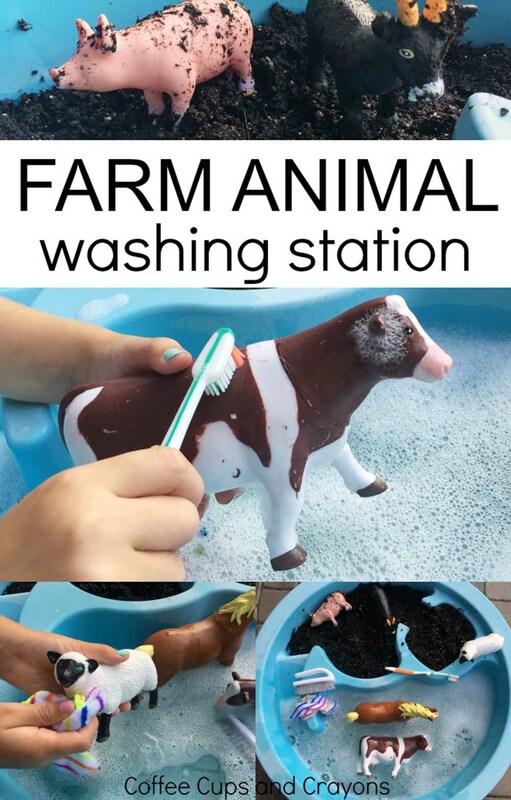 This farm animal toddler activity station is a great outdoor activity! Looking for some outdoor sensory fun? Why not grow your own vegetables in any space with these container vegetable garden ideas. 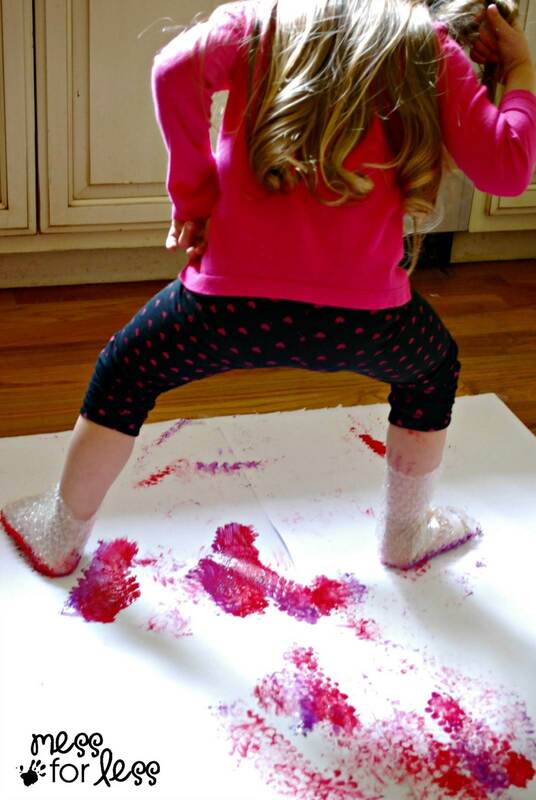 If you think sensory play is just a big messy play party, think twice! This hands-on activity is full of possibilities, simple to put together and will make for hours of play fun. 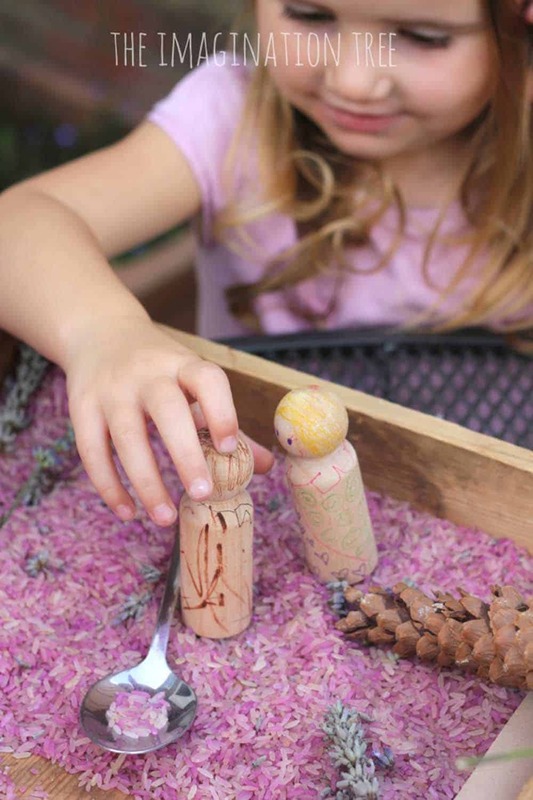 This lavender sensory play rice is great for helping to relax kids. It’s beautiful and will make your house smell good too! Great sensory table ideas for older kids. Buy some bright and fun buttons here. 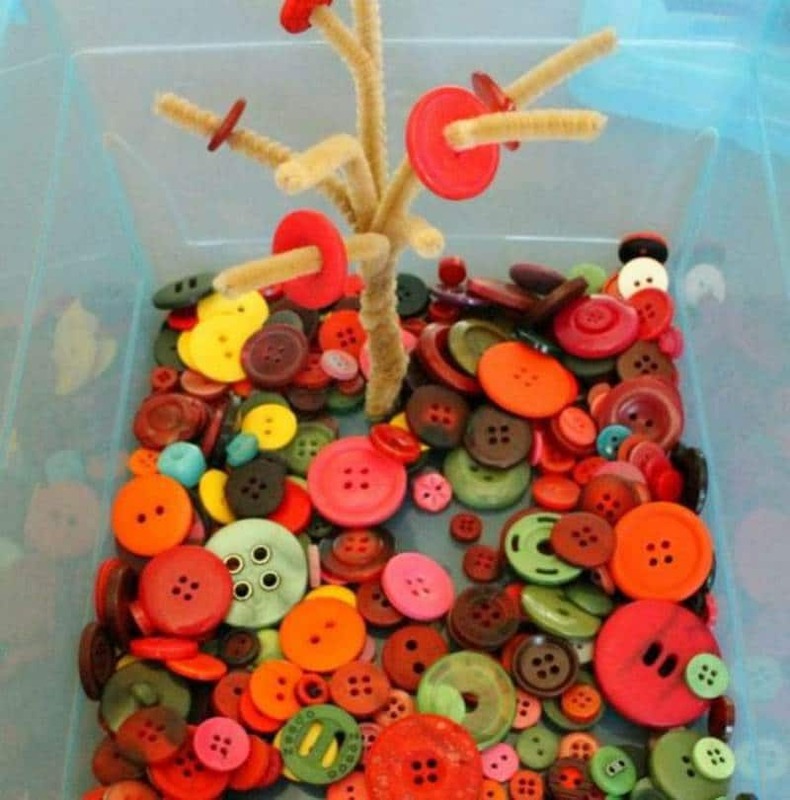 Boys and girls will love preschool sensory bins such as this one! 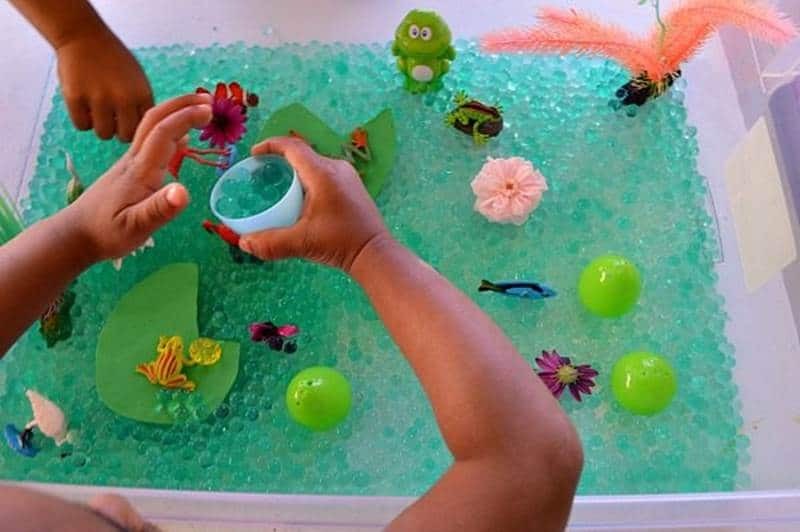 With the right materials you can also set up creative sensory activities for children like this life pond tray. Water and straw, how easy can this be? Seriously one of the easiest ideas for sensory bins for toddlers. Sensory Bags are a absolutely perfect to entertain babies, toddlers and pre-schoolers that still put things in their mouth. It is mess free and still gives them the opportunity to explore different textures while developing and learning. These bags give you the opportunity to add anything that may be topical to your classroom, season or of interest of the kids. Looking for Non messy play ideas for 1 year old? This is one of the best sensory activities for toddlers and babies. 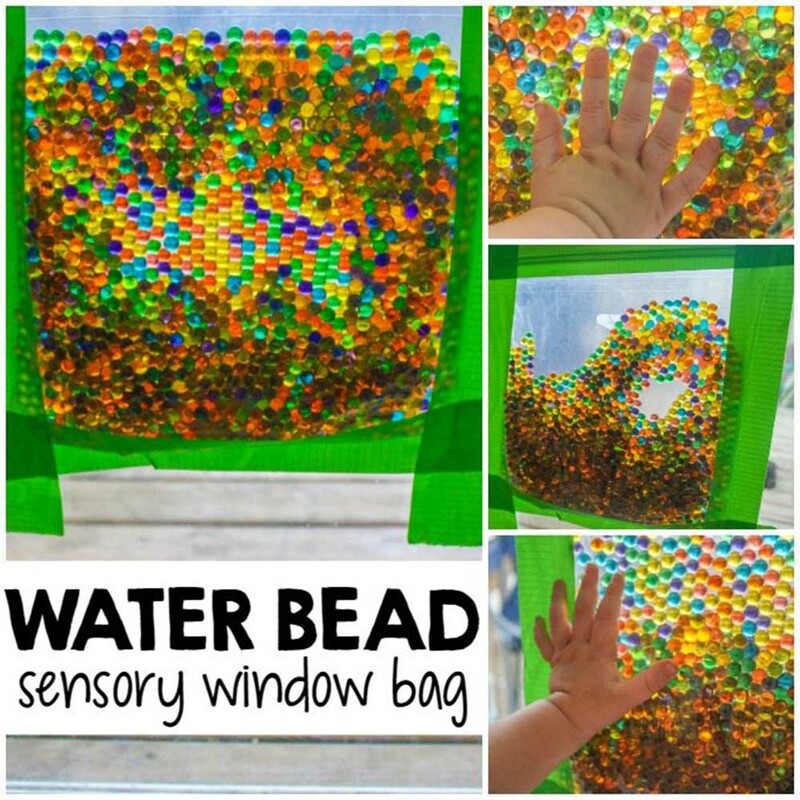 This water bead sensory activity window is so much fun! Not only does it feel super cool, but it looks so pretty! And the best part is that little ones who love putting water beads in their mouths are kept safe, while still being able to play with them. Buy water beads for sensory play here. Sensory bags are great to take on the go with you to keep baby occupied at any time. These are super easy to make and super durable! 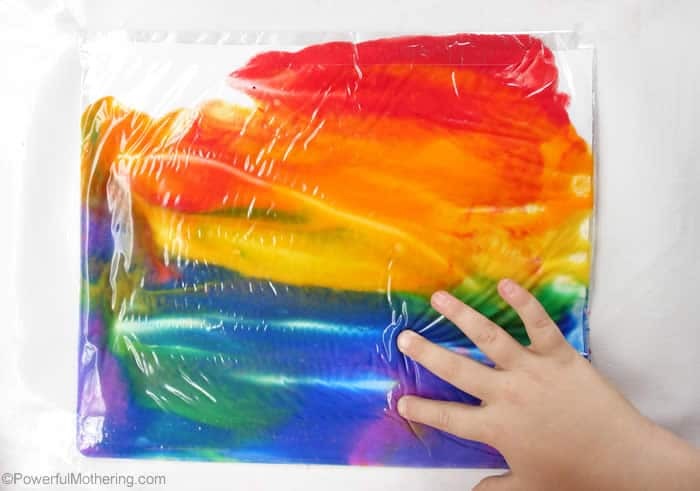 These rainbow bags are brilliant sensory activities for toddlers and infants. If you are worried about mess through sensory activities for babies, this one here will easy your mind. Eye spy sensory activities for preschoolers are simple but brilliant to integrate both learning and play. 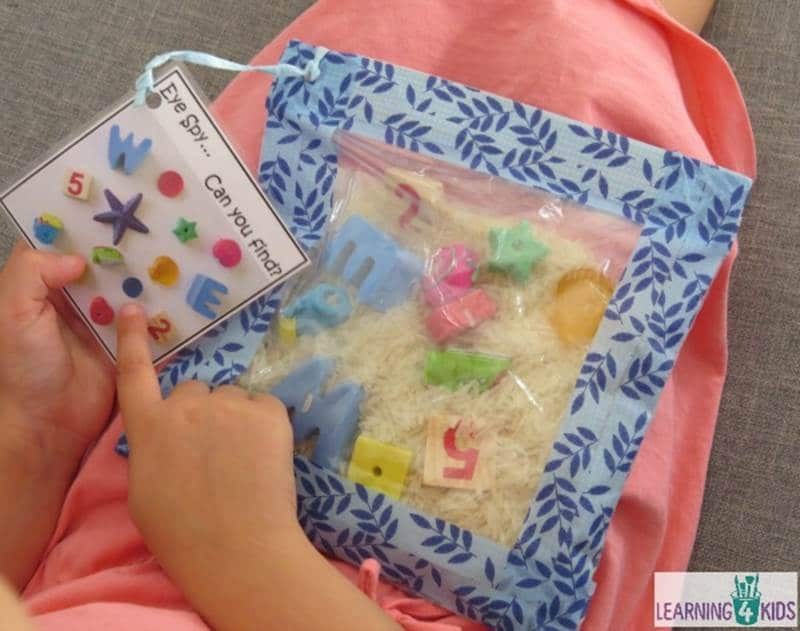 Using bags as sensory play ideas is definitely one of our favorite. 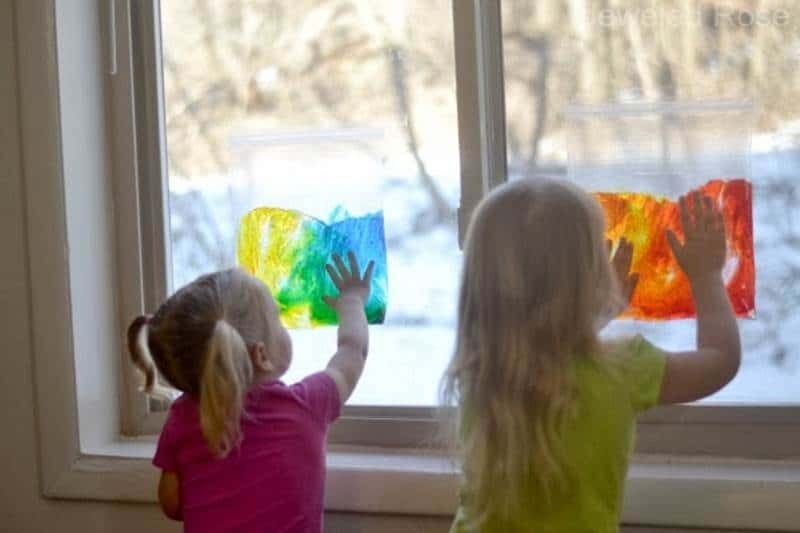 I love this sun catcher idea. 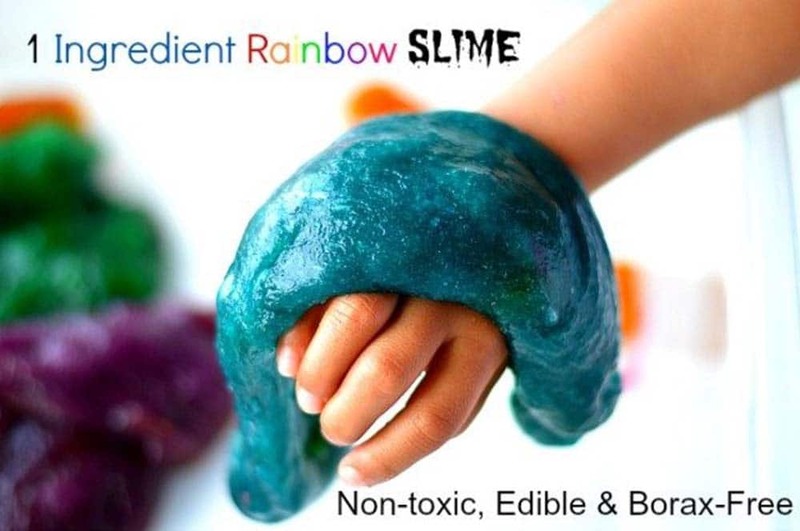 Making slime, putty and goop is an awesome science demonstration and sensory play activity for kids. And the best? They can be easily and quickly made at home or school. 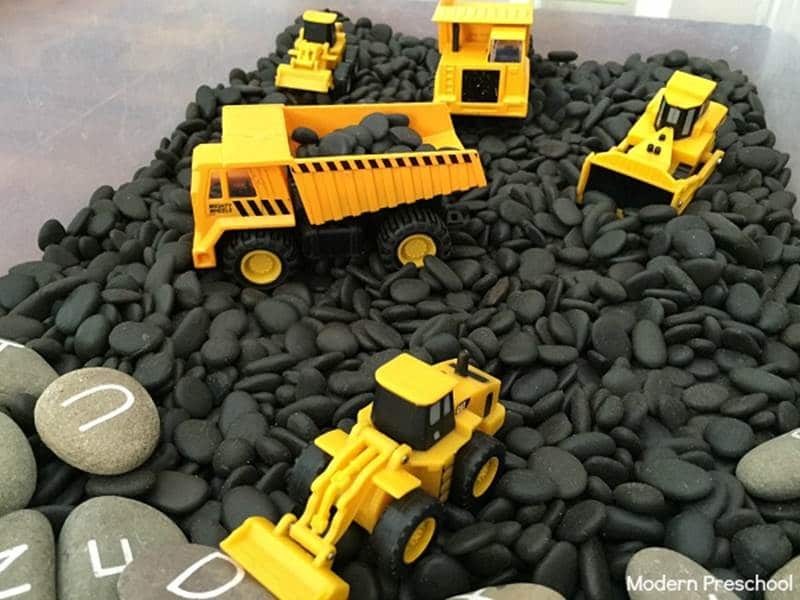 Definitely a great addition to your preschool sensory table. Look at these great recipes below. 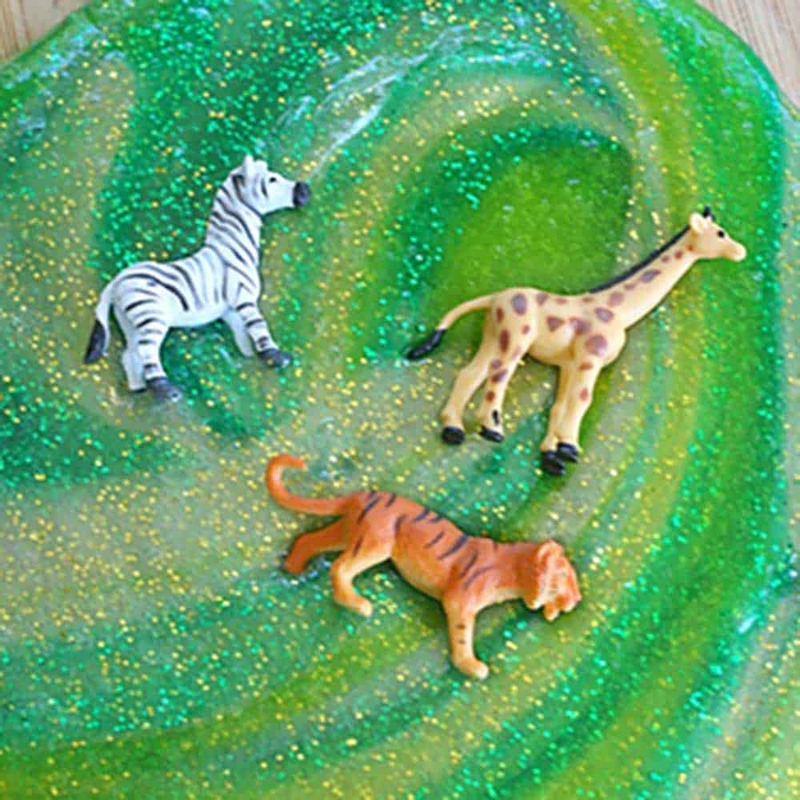 This simple jungle slime is so colorful and fun. Kids will love making it AND playing with it. Throw in some cute little animals and let their imaginations soar! This will be a hit on your preschool sensory table. 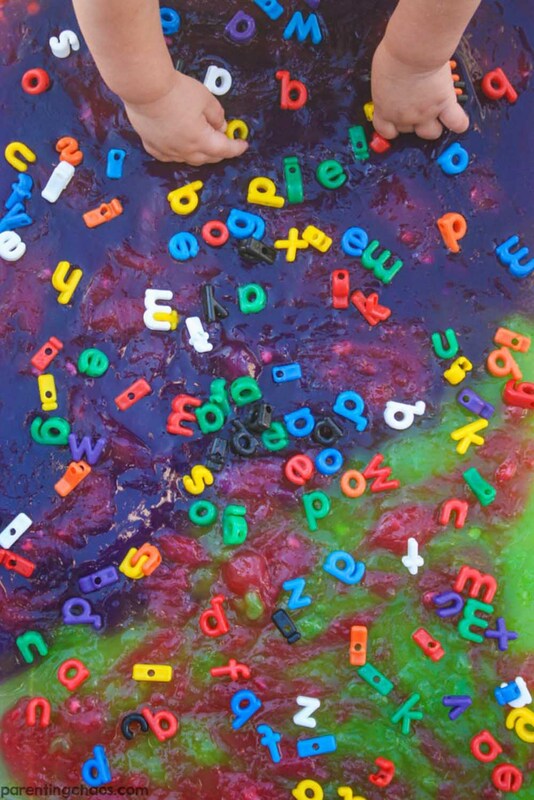 I love this edible alphabet slime soup because it combines some of my favorite things: edible water beads and learning ABC’s! 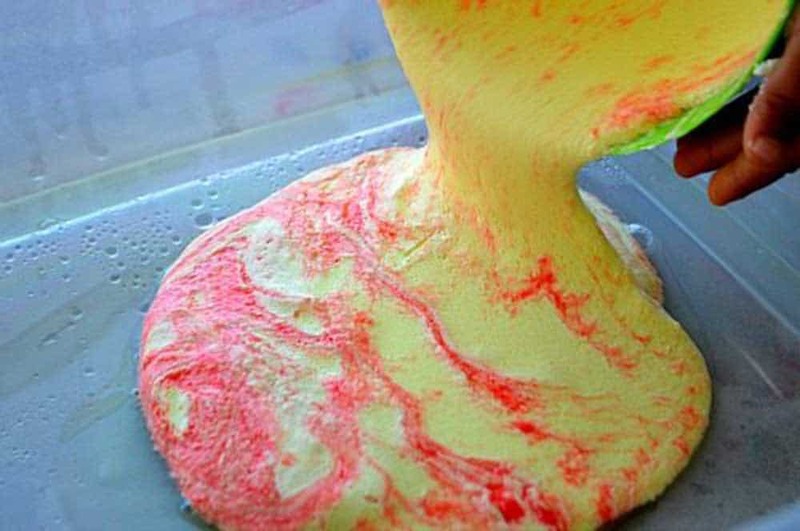 One ingredient slime! Yes please! Floam!! Another really expensive product that can easily be made at home. 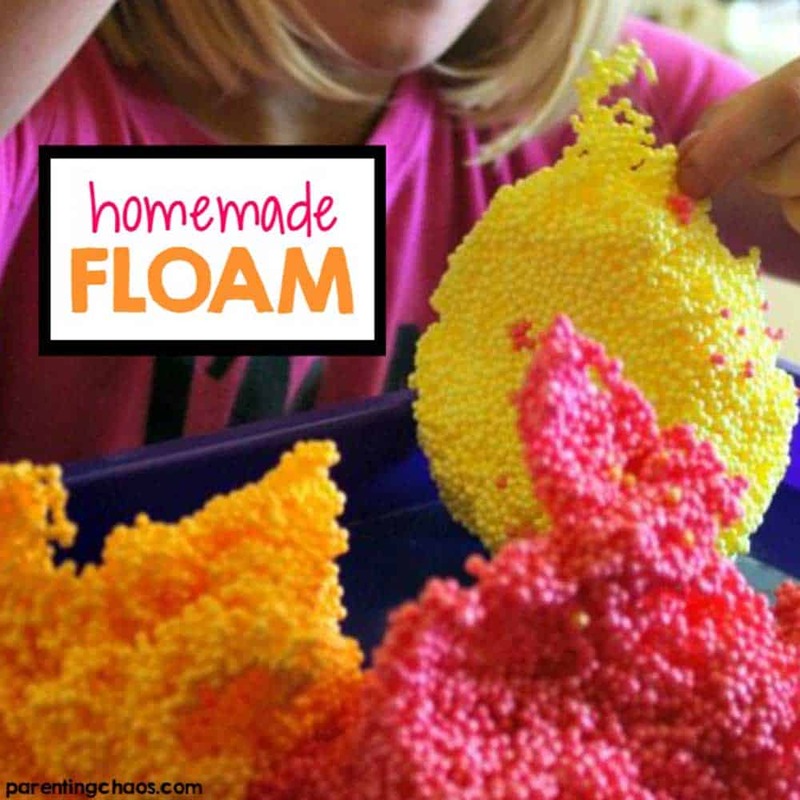 Who knew that foam beads had so many uses! 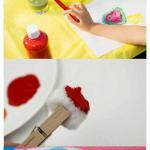 Make this messy play table today. I love creative play activities. It is impossible not to get mesmerized by the colors. The texture is just amazing. Great messy sensory table activities toddlers. These lemon suds are a great outdoor sensory activity! You can add whatever colors you like or any other scents you like. 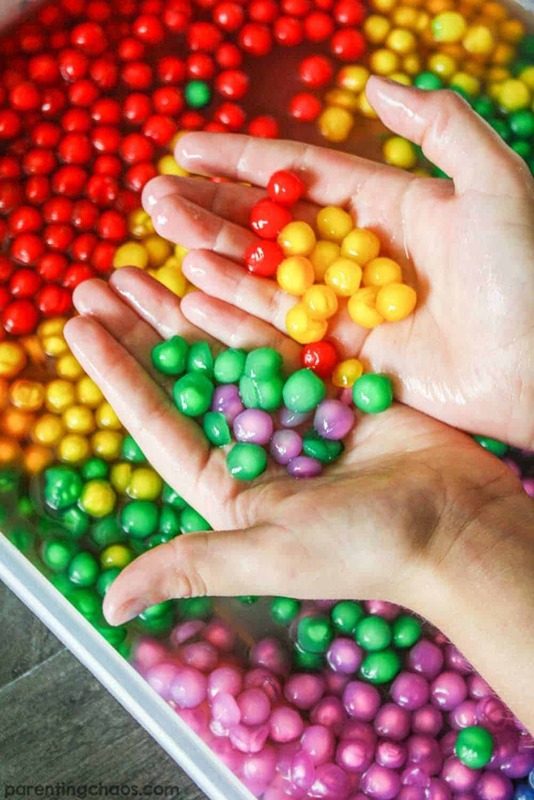 Sensory activities for kids are not only fun but they can be tasty! 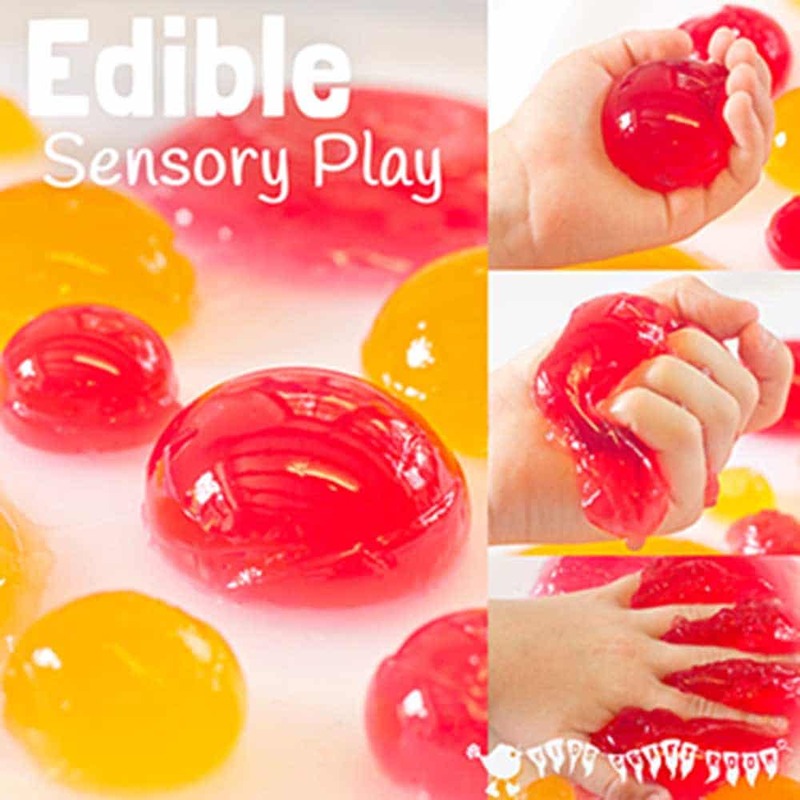 These edible sensory plays and activities are good for every kid but specially for the young ones! I’ve raised several babies in Hawaii and there’s one thing they love to do at the beach….eat sand! This edible sand is fantastic because it’s totally ok if your babies chow down! What’s better than sensory activities? Sensory activities that you can EAT! This fun activity only requires Jell-O and these super cheap ice ball makers Some of the coolest sensory table ideas for preschool. 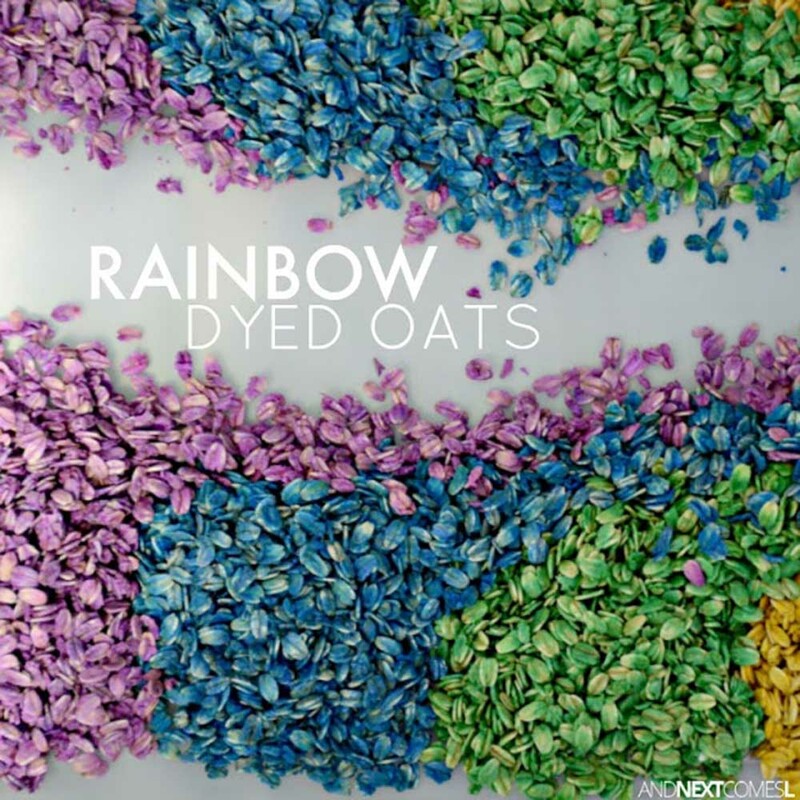 These fun and pretty rainbow dyed oats are an easy and affordable sensory experience for babies. You’ll just need oats and food coloring! This is a great for sensory bins for 1 year old as it is edible. This simple, edible playdough is one of the best sensory activities for toddlers who love to put things in their mouths. Totally edible and totally tasty! Love water beads, but have babies who like to eat them? Fear not! These baby-safe, edible water beads will be perfect for you! 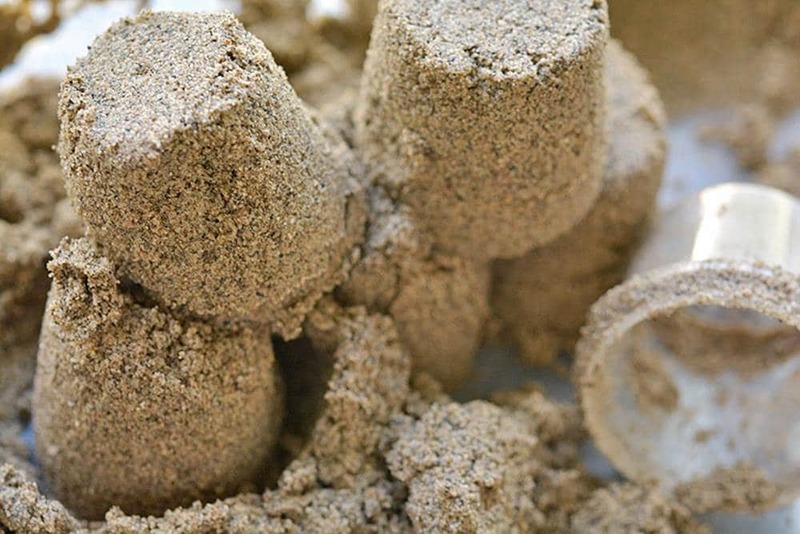 This edible moon sand is so different from any other sensory recipe I’ve ever made! Crazy ingredients, but crazy cool! One of the best early years messy play ideas I have seen! Sensory boards provide hands-on activity to help young kids to explore and learn about different objects, texture, sounds etc. They present many benefits, are super fun and can also be made using bits and pieces from your house. Find here some of great sensory board inspiration. These beautiful fabric boards are great to make if you’ve got extra fabric lying around or extra frames for that matter. And the best part? 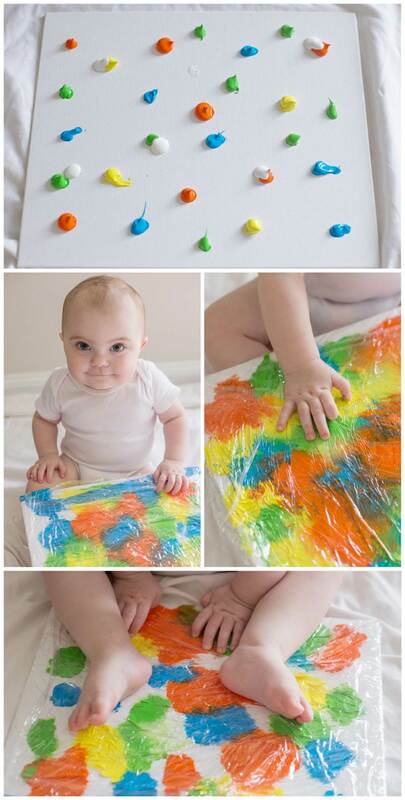 Totally non-messy activities for babies. Just be sure to remove the glass! Let kids feel the different textures of each fabric. It’s also great for learning their colors. Buy different sized frames here. 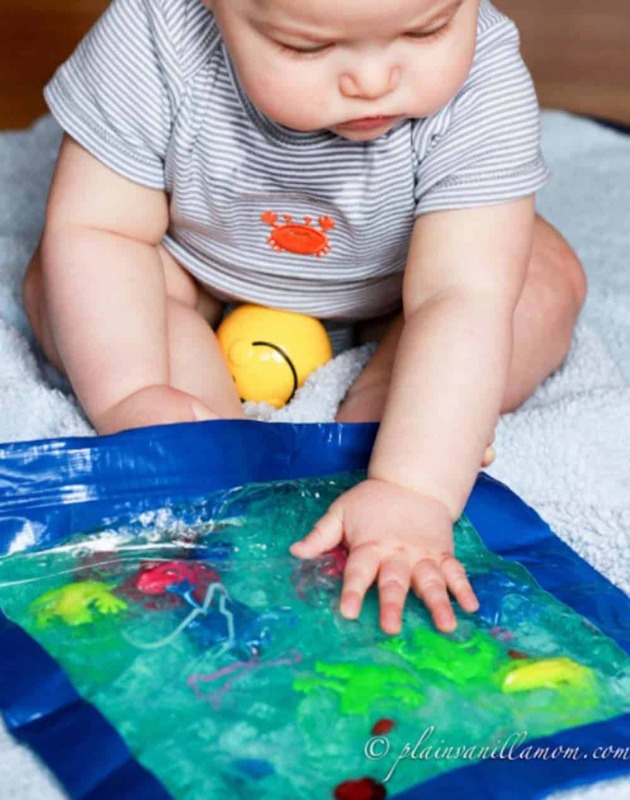 Sensory play is vital to early childhood development. You can create these cards in under 20 minutes and for less than a few dollars. Busy sensory boards are always a hit with kids. They love the different things to play and the hands-on tactile objects are excellent to explore and manipulate. This is a marvelous therapeutic activity that even adults would enjoy. So simple for children to touch and explore. Best prices for Mermaid Fabriccan be found here. How fun is it to upcycle materials from around the house and make something so clever and enjoyable for the kids. 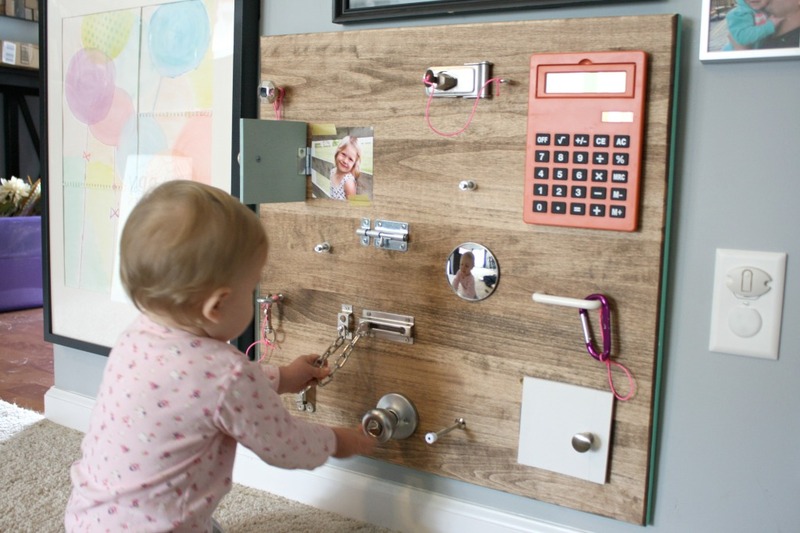 Use boards, old magnets you already have, touch lights, add velcro or anything that you can get your hands on. A very affordable activity. Truly anyone can make a sensory floor, mat, carpet or wall with a bit of creativity. 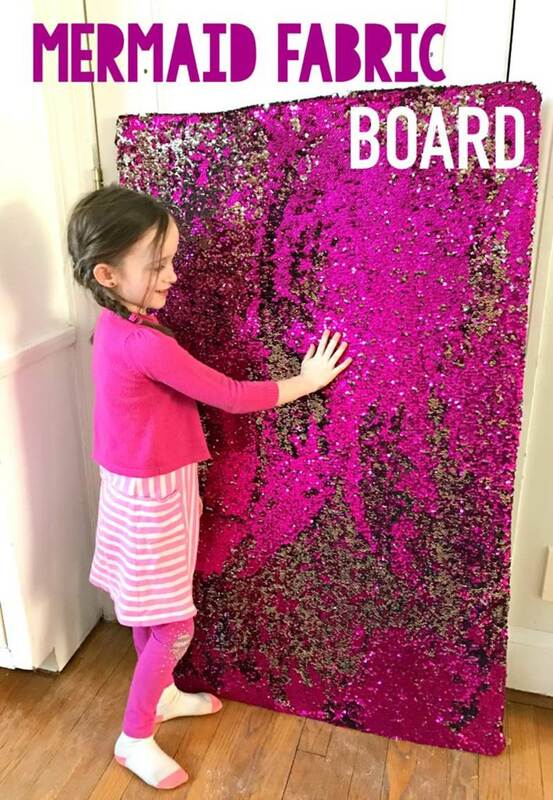 These DIY sensory boards are great for autism, SPD, Alzheimer’s and for anyone in the house or office in need of creative stimulation! These sensory activities are great for adults too. They help relieve stress while working your hand muscles. Why get some of the boring ready-made balls if you can make your own at home? 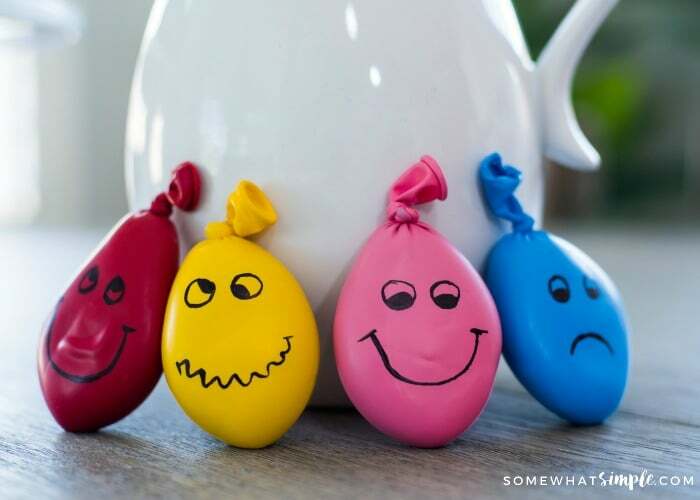 Here are some of our favorite sensory stress balls for you to make today. Water beads again! Can you tell I LOVE water beads? They’re just so fun and squishy! I seriously can’t get enough. And they are also super CHEAP! I bought a giant bag two years ago and we are still going through it! This is another great sensory activity for little ones who like to put water beads in their mouths! 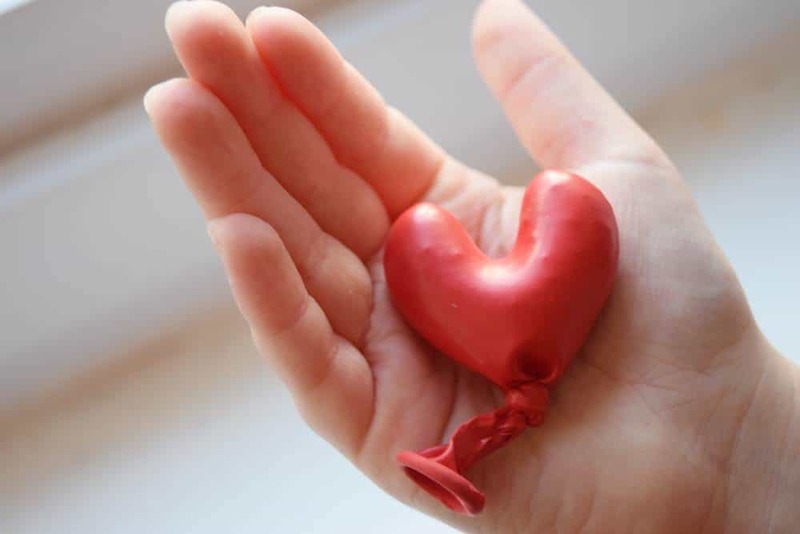 Easy tutorial on how to make a homemade stress ball using heart balloons. What a cute idea! Great sensory play for toddlers and preschoolers. 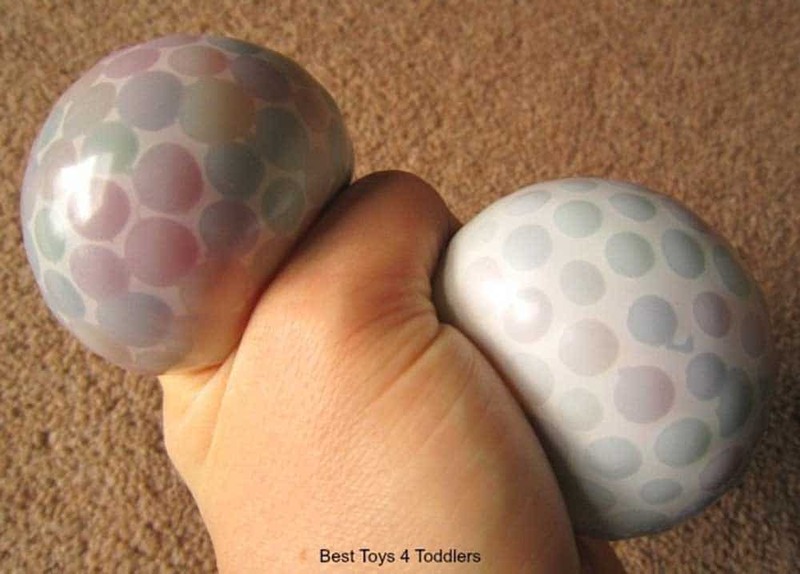 One of the best stress ball for kids that I have seen! 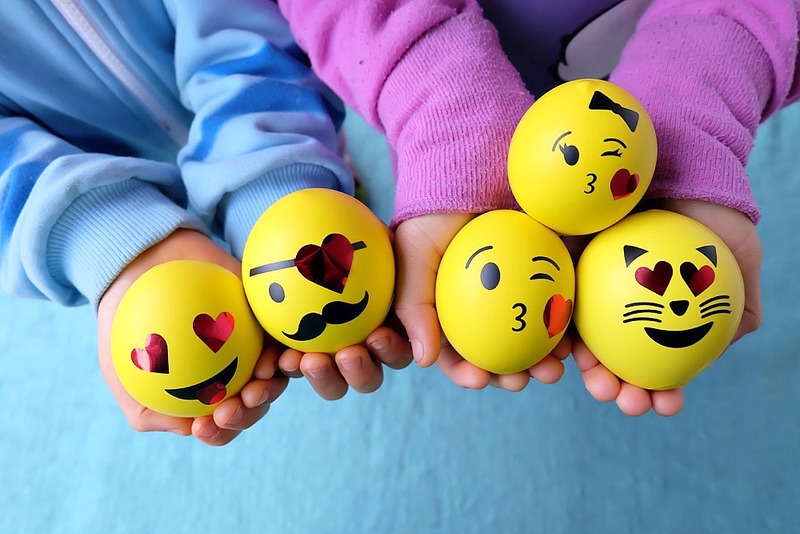 You can decorate these squishy balls in so many ways. My kids LOVE kinetic sand, but dang that stuff is so expensive!! 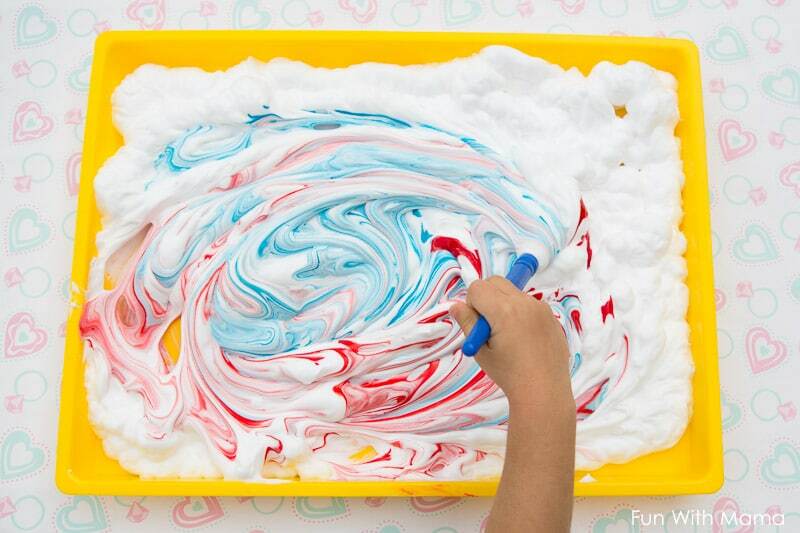 Why not make your own with this Shaving Cream Foam Sand. Kids can play with sand every day of the year regardless of the season. 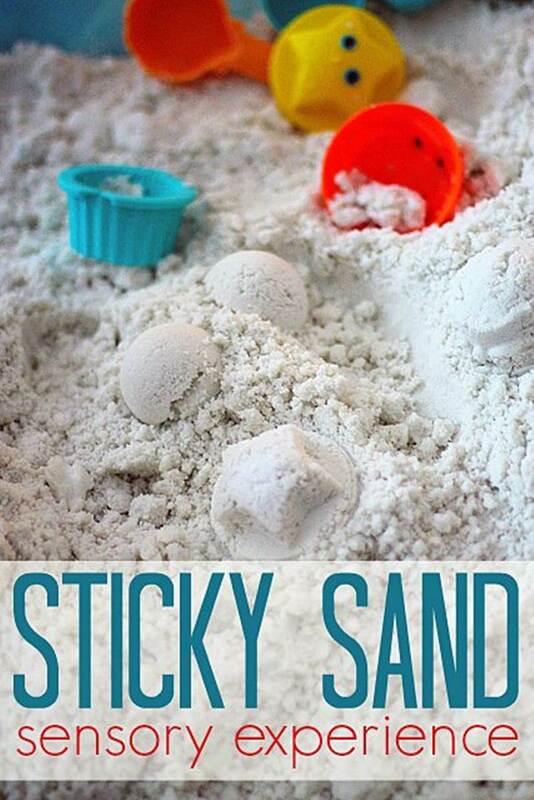 Check this sticky sand sensory bin idea. 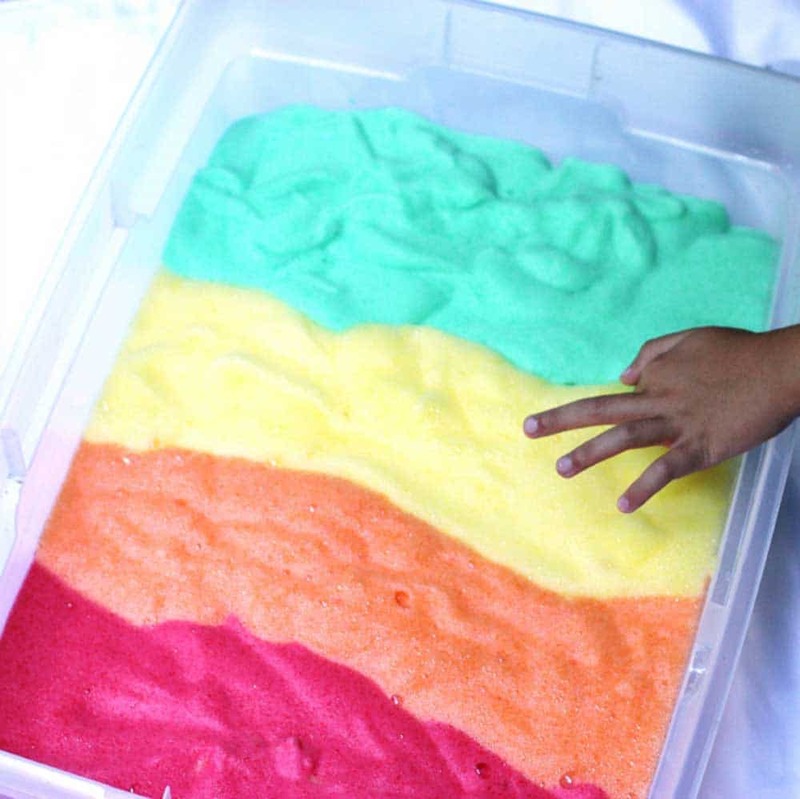 Sand is a very simple sensory play activity for kids of all ages from infants to older kids. But why not to make it even more interesting and add some color? 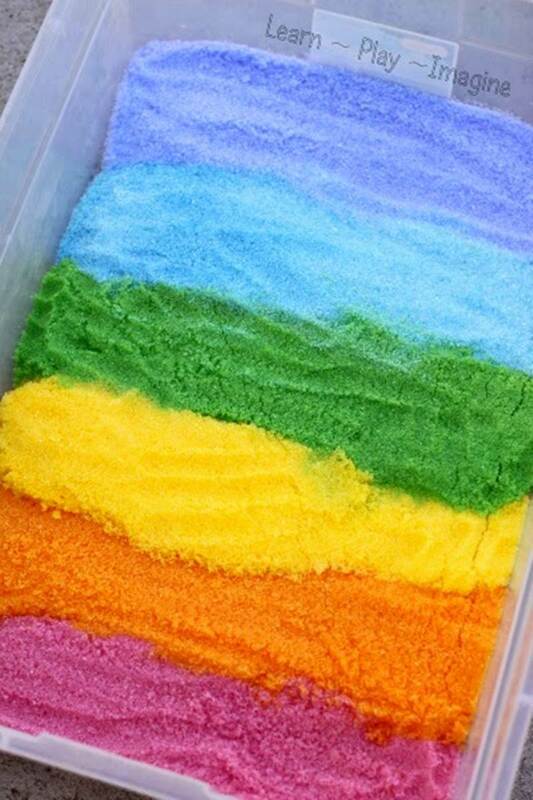 This Epsom salt rainbow sand tutorial is so easy. Looking for more ways to entertain children? Head over to our 50 Ways to Keep Children Happy Without Spending a Dime for more ideas.